Greetings from the IPSI Secretariat in Tokyo, Japan. IPSI and its members continue to stay active in a wide variety of projects and activities related to maintaining and revitalizing socio-ecological production landscapes and seascapes (SEPLS), particularly as we look forward to next month’s Fifth IPSI Global Conference (IPSI-5) in Pyeongchang, Republic of Korea. This issue of the IPSI Newsletter contains more information about the IPSI-5 conference. Be sure to check the IPSI website for the latest information about the conference and other past and upcoming activities. We would like to strongly urge any members who are planning to attend but have not yet registered to contact the IPSI Secretariat immediately. This month we also bring you news of our friend Professor Alfred Oteng-Yeboah, who was recently awarded the Midori Prize in Biodiversity, and preliminary information about IPSI’s activities at the upcoming World Parks Congress 2014 in Sydney. We also are pleased to share a report of one of our recently submitted Case Study reports. We thank you for subscribing, and for your continued support of IPSI. The Fifth IPSI Global Conference (IPSI-5) will be held from 4 to 5 October 2014 in Pyeongchang, Republic of Korea. The conference will be held back-to-back with the twelfth Conference of the Parties to the Convention on Biological Diversity (CBD COP12), and will be a good chance for many IPSI members and non-members alike to meet in person and discuss further ways to collaborate and promote the principles of the Satoyama Initiative. The IPSI Global Conference consists of two main events, the Assembly and the Public Forum. The Assembly will be held from 14:00 to 17:00 on Saturday, 4 October 2014 in Hall G, Room 3. The assembly is primarily for information-sharing and decisions regarding the future direction of IPSI, and all IPSI members are encouraged to attend. The Public Forum is open to the general public as well as IPSI members, and will be held from 9:00 to 13:00 on Sunday, 5 October 2014 in Hall G, Room 3. The theme of this year’s Public Forum is “Furthering action in production landscapes and seascapes for sustainable development“. The Public Forum is an opportunity for non-members to learn about IPSI and its activities as well as a venue for discussion of various topics related to socio-ecological production landscapes and seascapes (SEPLS), their revitalization and sustainable management. IPSI members wishing to attend the Assembly who have not yet registered should contact the IPSI Secretariat urgently to complete registration procedures. Any IPSI non-members wishing to attend the Public Forum or IPSI members wishing to attend the Public Forum only are kindly requested to inform the IPSI Secretariat of their name, title, organization name, and contact information before the event. A number of IPSI members have also let us know about events that they will be involved in, and we encourage others to inform us of their planned activities so that we can share the information among our membership. Please feel free to contact the IPSI Secretariat with any questions or comments, and to let us know about your plans for CBD COP12. More information about IPSI-5 can be found on the IPSI-5 event page on the IPSI website. N.B. : Participants are required to register for the CBD CO12 in order to attend these events. Please click on the link below for details. The winners of the MIDORI Prize for Biodiversity 2014 have been announced, and the IPSI Secretariat is pleased to report that the Chair of the IPSI Steering Committee, Professor Alfred Oteng-Yeboah of the Ghana National Biodiversity Committee, has been named as one of the three recipients. The MIDORI Prize is a biennial international prize organized by the AEON Environmental Foundation and the Secretariat of the Convention on Biological Diversity (CBD) to honor individuals who have made outstanding contributions to the conservation and sustainable use of biodiversity at global, regional or local levels. We hope you will join us in congratulating Prof. Oteng-Yeboah on this great honor and in thanking him for his longstanding commitment to IPSI and the Satoyama Initiative. 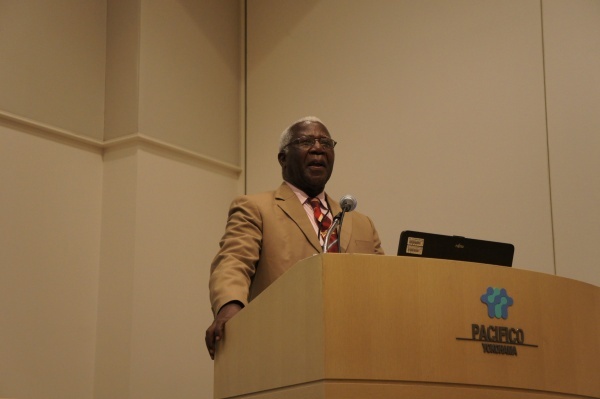 Below: Prof. Alfred Oteng-Yeboah speaks at a 2012 IPSI event. The IPSI Secretariat and many IPSI members are planning to take part in a number of events and activities at the IUCN World Parks Congress 2014, to be held from 12 to 19 November 2014 in Sydney, Australia. The World Parks Congress is one of the largest meetings for protected areas and their sustainable management, and is held only once in a decade. IPSI members and the Secretariat have been contributing to the preparation process including attending preliminary meetings such as the 1st Asia Parks Congress in Sendai, Japan in 2013 and the IV Mesoamerican Congress on Protected Areas held in San José, Costa Rica earlier this year. The IPSI Secretariat is particularly interested in hearing about any IPSI members that plan to attend and take part in the World Parks Congress. If you plan to attend, please contact the Secretariat and let us know about your planned activities, so that we can maximize the opportunities for collaboration among the IPSI community. More information about the IUCN World Parks Congress 2014 can be found on its website. The IPSI Secretariat is pleased to have received a Case Study report from member the Critical Ecosystem Partnership Fund (CEPF) regarding their work in partnership with the Wildlife Conservation Society (WCS) in Cambodia. 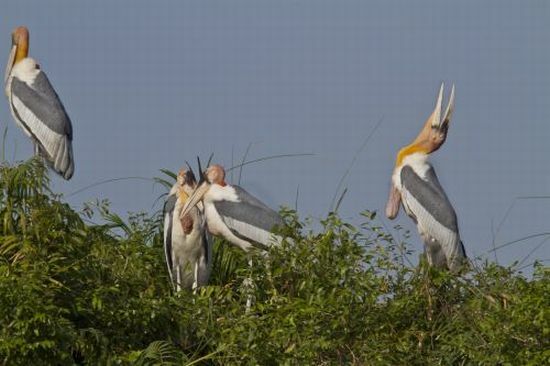 Cambodia supports globally important populations of wide-ranging, large-bodied bird species that are threatened by agricultural intensification and expansion, trade-driven hunting and chick/egg collection at nest sites. To address this problem of escalating biodiversity loss in the Northern Plains and Tonle Sap Lake and Floodplain and encourage community participation, WCS and partners designed a project with three financial incentive schemes. With funding from CEPF provided through the Indo-Burma biodiversity hotspot investment, WCS expanded the project to new sites and species to improve the project’s long-term financial viability and to increase the role of local civil society partners. The goal was to secure core populations of a suite of globally threatened bird species at four sites in Cambodia through a series of innovative conservation interventions focusing on providing direct incentives to local communities, namely payments for birds’ nest protection, improved value chains for “wildlife friendly” produce and ecotourism development. Another goal was to strengthen the capacity of local organizations to engage in long-term conservation efforts for the bird species. The full write-up of the case study can be found on the IPSI website. The IPSI Secretariat recently moved from Yokohama to the UNU headquarters building in Tokyo. We ask that you update your files with our new contact information as below.